A blog page is the best possible way to engage your website audience and like-minded visitors. Blog is an abbreviation of the word web log and is often used as an online journal that you can open up to comments from others. You can create a blog and publish posts just like you create and design a web page. To add a blog page to your website, hover mouse over the menu and click on Add Page button. Once the New Page window is open, click on &apos;Blogs&apos; option from the left-hand side navigation menu. You may also create a blog page by clicking on Manage and choosing Blogs from the drop-down menu. When prompted, enter a name for your blog. This name will be used in the URL. You can draft blog posts, save them for publishing later or schedule the blog post to be posted automatically at a later time or post it immediately. But to publish them, your website needs to be published first. 1. Access the Blog page from the site builder, and click on "New Post". 2. Specify a title for your blog post. 3. As for the body of your blog, you can customize it with all the elements you would normally use on your website - text, images, headings, videos and all the rest of it. 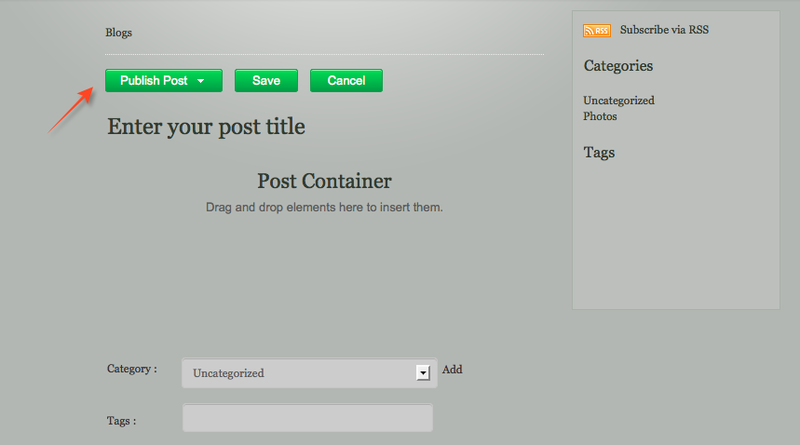 Drag the needed elements to use them on your blog container area, just as you&apos;d built your website. 4. By default, posts will be uncategorized, with no tags. You can add new ones or pick existing ones from the list. When you choose to schedule the post automatically at a later time, hover mouse over Publish Post button and click on Schedule for later option. A new window would pop-up, asking for the date and time you want the blog to be published. 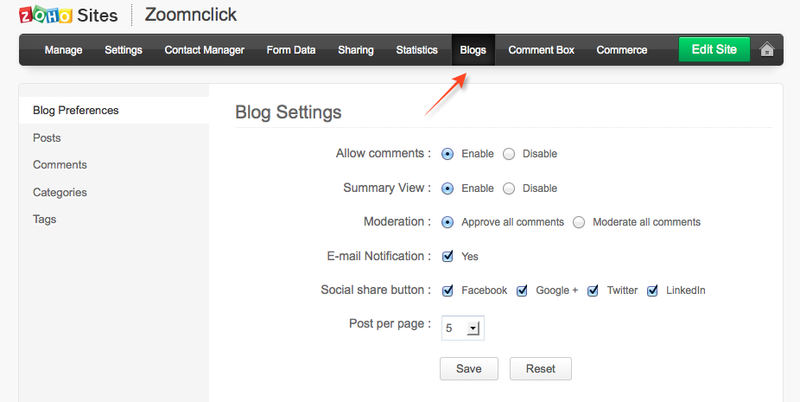 Now that your blog has been activated, go to Manage > Blogs to manage posts and set your preferences. This page has all settings for comment moderation, email notification and social share buttons. If enabled, each of your blog posts will have the social share buttons, making it easy for your visitors to share your content. 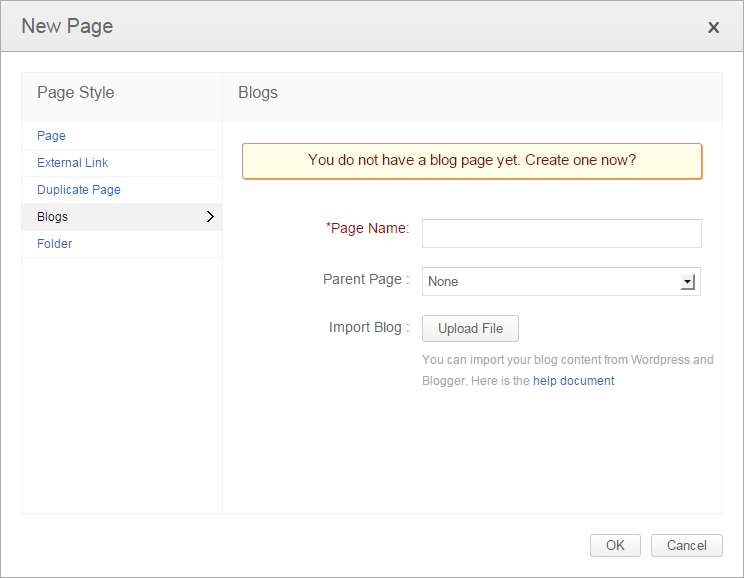 You can also restrict the number of blog posts displayed on each page. Use the list on the left to navigate to Comment settings, Categories and Tags. 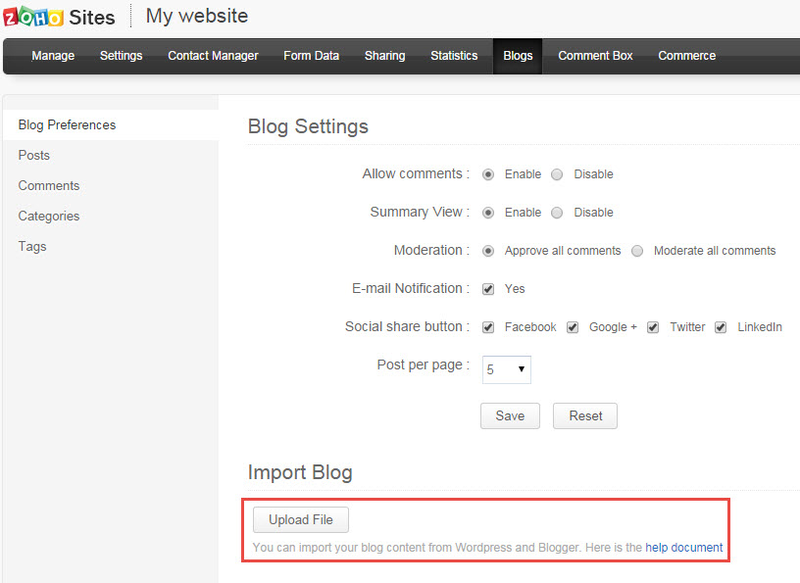 You can now use blog import option to import blogs from WordPress and Blogger instead of manually copying them from these blogging sites. All you need to do is export your blogs from WordPress or Blogger and import it into your blog page on Zoho Sites website builder. 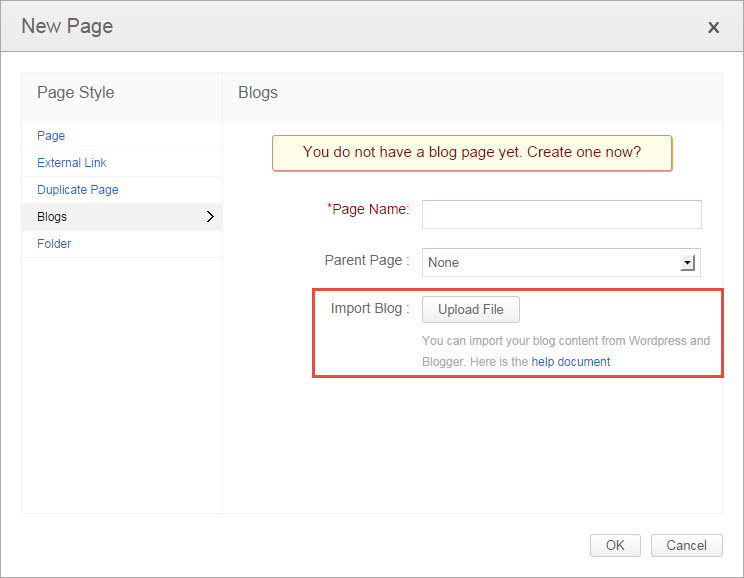 Both WordPress and Blogger provides the option to export their blog posts in xml file. The Author name for posts that you have created in Zoho Sites and also the imported blog posts will be the nick name on your Zoho account. In this case, click on "New" option on the top left-hand side in your Zoho Sites website builder, click on Blogs from the left-hand side menu and you will have the option to import your blogs in XML format. You get this XML file when you export your blog page from WordPress/Blogger. If you already have created a blog page for your website in Zoho Sites website builder and want to import more from WordPress or Blogger, simply go to Manage > Blogs, click on import blog to add your XML file into your existing blog page in Zoho Sites. Note: When a blog is imported to Zoho Sites, the blog post title, blog post contents (only text and images), date and time of blog post, categories and tags will be imported. Other contents in your blog posts like maps, forms, polls etc., will not be imported in Zoho Sites. There will be no changes in the created date and time of the imported blog posts and blog posts will be listed based on their created date and time, with the latest blog being listed on the top of the blog page.